Thin was definitely in at SIHH this year and the trend is likely to spill over into Baselworld 2011 in a few weeks time. 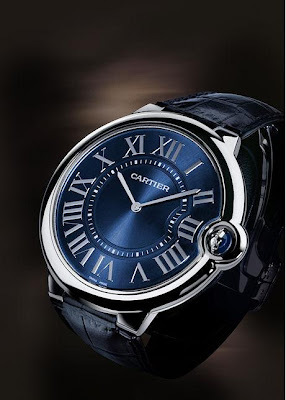 Cartier’s new creation is the Extra-flat Ballon Bleu de Cartier. What it may lack in width it certainly makes up for in size, it’s impressively large at 46mm, making a svelte and powerful statement on the wrist with the signature blue cabochon crown dominating the case sides accentuating its presence to stunning effect. 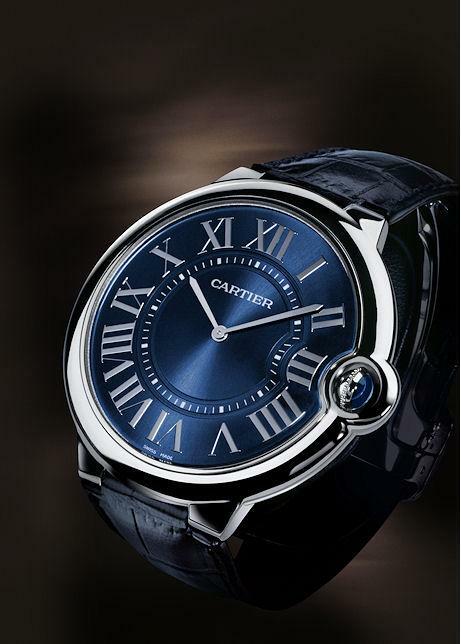 The Extra-flat Ballon Bleu de Cartier is available in pink gold, white gold, and platinum. The gold versions have silver guilloché dials, while the dial on the platinum version is deep blue with large Roman numerals and a minute track. All versions have the large blue cabochon crown, and are water resistant to 30 metres – but of course this a dress watch so the closest it is ever likely to get to water is a quick rinse of your hands in the restaurant. All three versions are available in numbered limited series. The new look dial is a simplified version of what was on offer last year, and is all the better for it with a highly readable dial protected by a top-quality sapphire crystal. The new watch comes without the central second hand and there is no date window at 3 o’clock. The platinum version of the watch features a deep-blue dial which is decorated a pertinent sunburst finish and provides the watch with even more depth. The watches come on a brown or blue alligator leather strap with a double adjustable folding clasp, sculptured in 18 carat pink gold, white gold or 950/1000 platinum according to choice. And the price? Well, your wallet is destined to be equally slim. The pink gold is likely to retail for around US$20,300, white gold for US$21,800, and the platinum (deep breath) for US$32,550.